There are races you run for your PBs. Boring sissy flat courses like the Dubai Marathon or vibrant city courses like Chicago, New York or Mumbai where the crowds energize and propel you every step of the way. Then there are tough ultras with steep climbs and treacherous terrains that will demand every ounce of grit from you – completing them is ample reward. KTM is neither of those type of races. You run KTM because it tests you. You run KTM because it asks questions of you. Weeks after the race, you’ll still be searching for answers to “what exactly went wrong?” I mean, the course is rather innocuous, right? A rustic flat trail next to one of the Kaveri canals with just one (100 meter) incline. Some say the heat makes it potent. Others swear it’s the humidity due to the proximity to the canal. The course discoverer (Jugy) pithily says “It’s just the bloody course.” My theory is that the sheer desolation of the second loop strips you bare and your inner demons lie exposed — how you deal with them defines your race outcome. If you want to build character, run KTM. If I ever had to audition for a Don’t mess with me role, I’d think of this moment (KTM 2012) — somewhere at the 4 1/2 hour mark when the ground had become so hot that I had to sprint 100 meter distances in a bizarre game of wheres-my-next-shade-oasis. It was not enjoyable. But it didn’t kill me. And that’s what matters. 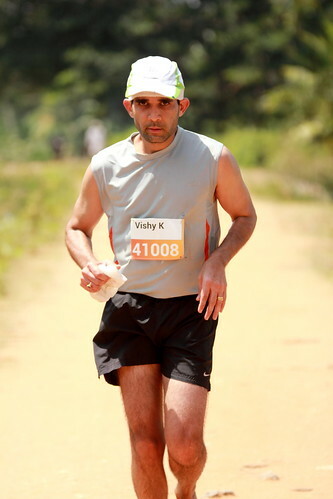 KTM 2012 was my first barefoot trail marathon. Compared to last season, I have a lot more barefoot mileage under my soles and a few less demons in my head. That, combined with the fact that this could be my last race at this venue, is making my heart beat faster as race day approaches. Why is this your last KTM ? Operative word is “could” 🙂 There’s a post for that too.